HONMA GOLF CO., Ltd.,(Head office: Roppongi Hills Mori Tower 35F, 6-10-1 Roppongi,Minato-ku, Tokyo; Representative Director & President:Koji Nishitani) sign a clubs and article use contract professional golfer player; Hiroshi Iwata won the Fujisankei Classic Golf Tournament held at Fujizakura Country Club, in Yamanashi Prefecture, on Sunday for his first tour title since he started his professional career in 2004. Started his final round at 3rd place, 2 strokes behind the leader, Hiroshi Iwata scored 6 birdies and 1 bogie in the "66", became best score of the day! Before he was tied for the lowest round of the day, finished the week at 10-under. 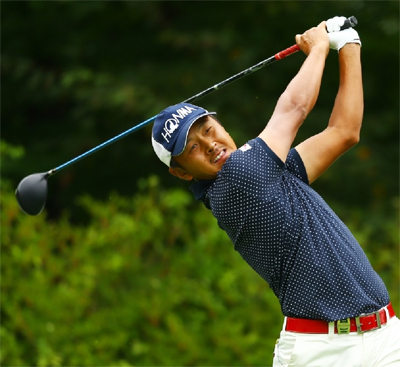 He came from behind to win the Fujisankei Classic by one shot, which was on the last 18th hole second shot, he aimed deadly on the target and the ball bite the green within 1.5m to the pin flag. He scored and entered seven times in Top Ten rank this season. And now with this victory, his money rank tie is in second place with same TEAM HONMA member, Kome Oda. Please expect great achievement at the second half of this season. I am really glad to win this tournament. The winning shot of the18th hole was the key to this victory. I had at least 190 yards left and first I chose 6I, but to have full power into this last shot, I decided to use 7I with maximum swing. It was the decisive factor of championship to choose 7I full shot. "This shot was the best of the day and have given me the feeling that I was able to convey my shot through a TOUR WORLD club". I will devote myself to hard exercise and practice to win the championship again! So please support me continuously.